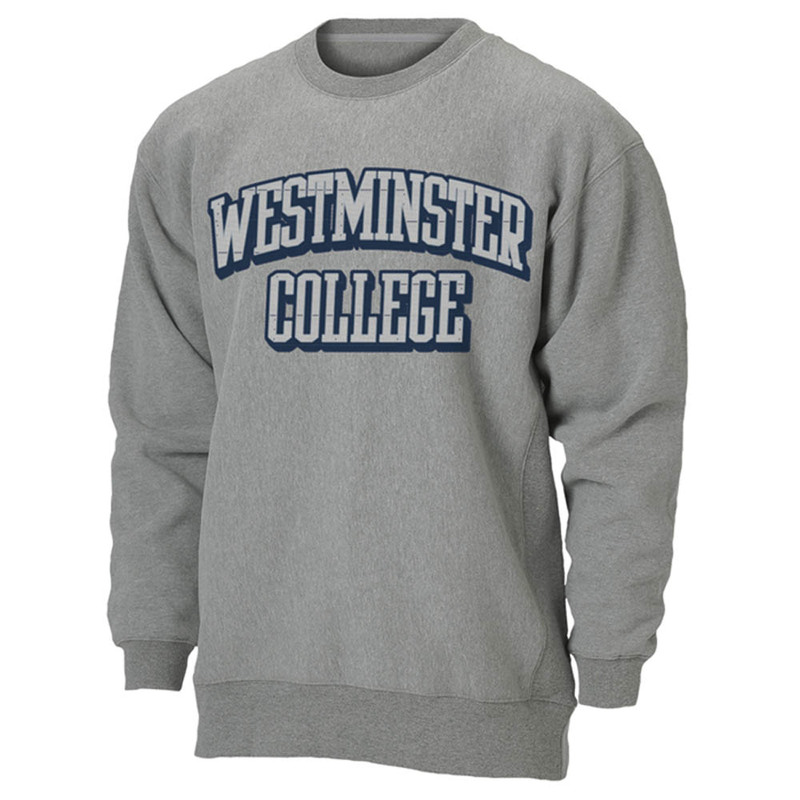 Crewneck sweatshirt with Westminster College and seal imprinted in 3 1/2-inch screen print lettering. Available in white, ash, oxford, and navy. 50/50 cotton/polyester. 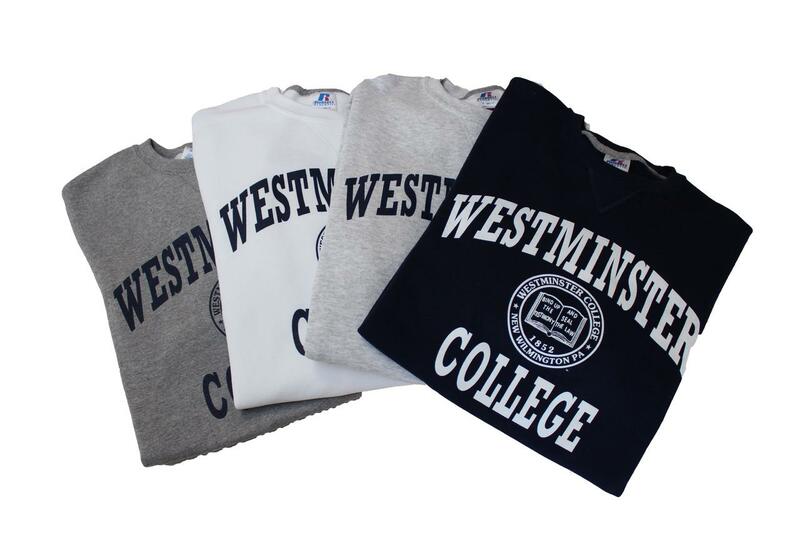 Please select option for Westminster Basic Crew Sweatshirt-Oxford, White, Ash, Navy. 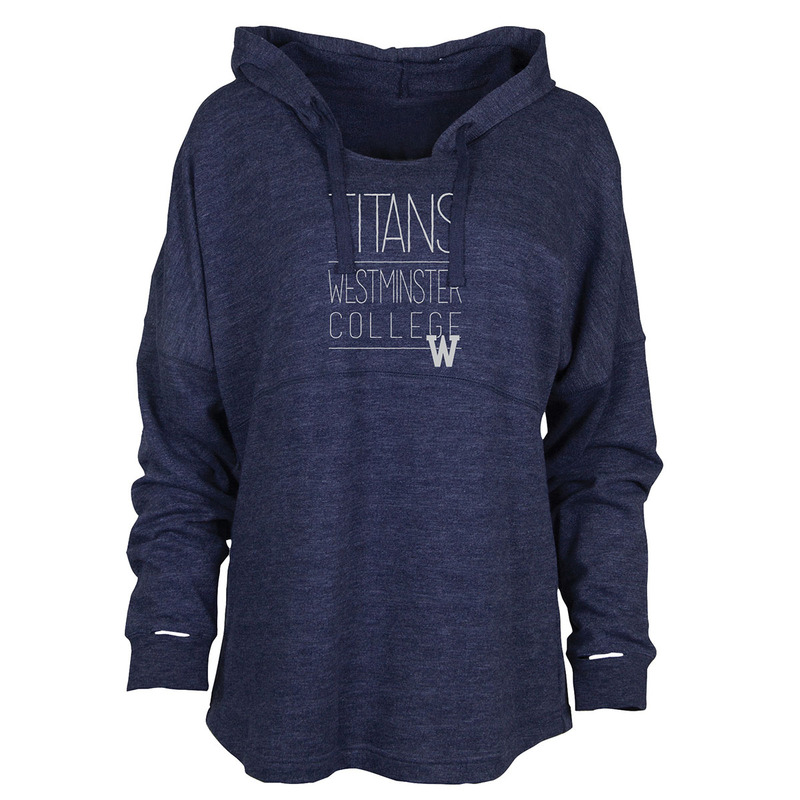 ALUMNI Fusion Quarter Zip has two front pockets, with contrasting shoulder and sleeve inserts. 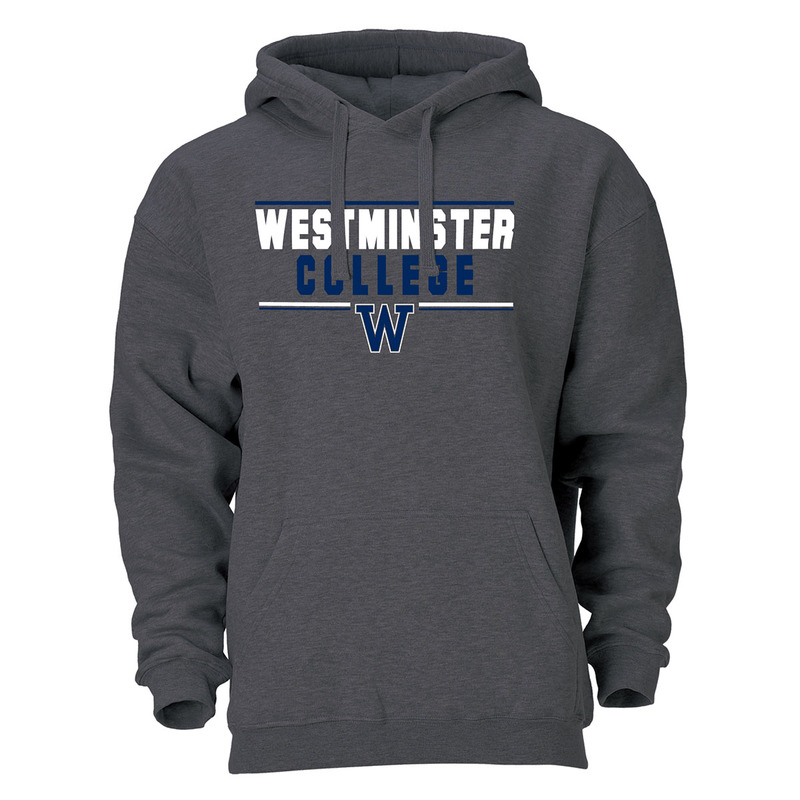 100% heathered polyester. Available in Gray. 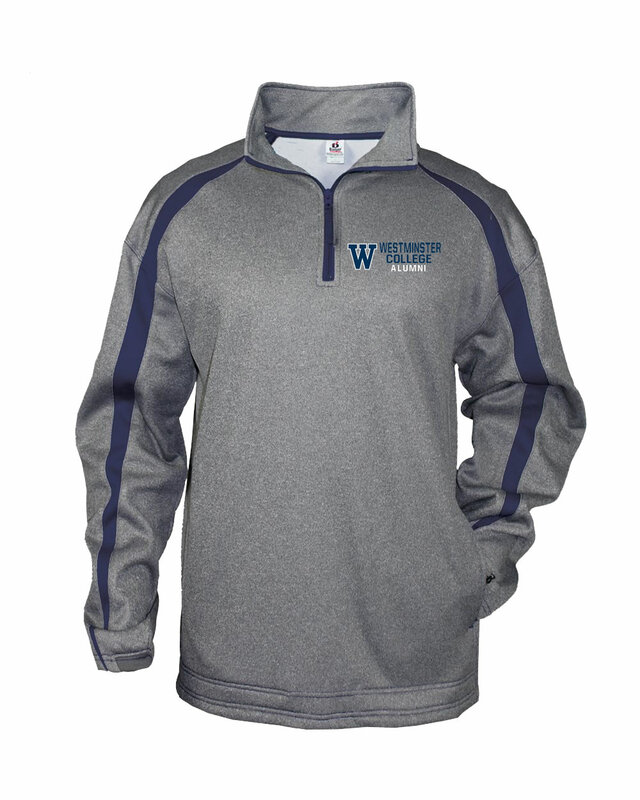 Please select option for ALUMNI Fusion Quarter Zip-Steel Gray. Ouray Benchmark Color Blast full zip sweatshirt jacket features rib knit cuffs and bottom opening. 65% cotton/35% polyester. 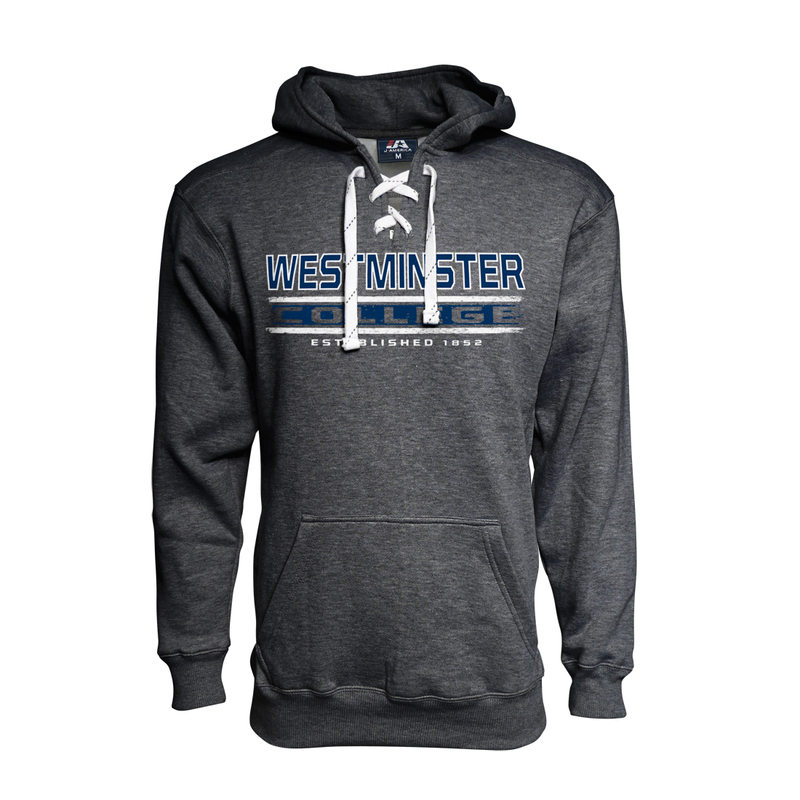 Available in navy with interior contrast gray hood and over-lock stitching with matching embroidered Westminster College on left chest. Please select option for Benchmark Color Blast Full Zip Sweatshirt Jacket-Navy. Ouray Benchmark Contrast hoodie has a two-layer hood, featuring a classic kangaroo pouch pocket with navy contrast hood, draw cords and sleeves. Has embroidered lettering. 70% cotton/30% polyester. Available in light oxford gray. Please select option for Benchmark Contrast Hoodie-Oxford. Ouray Benchmark Hooded Sweatshirt features rib knit cuffs and bottom opening with screen print lettering. 65% cotton/35% polyester. Available in dark gray with white/navy screenprinted lettering. 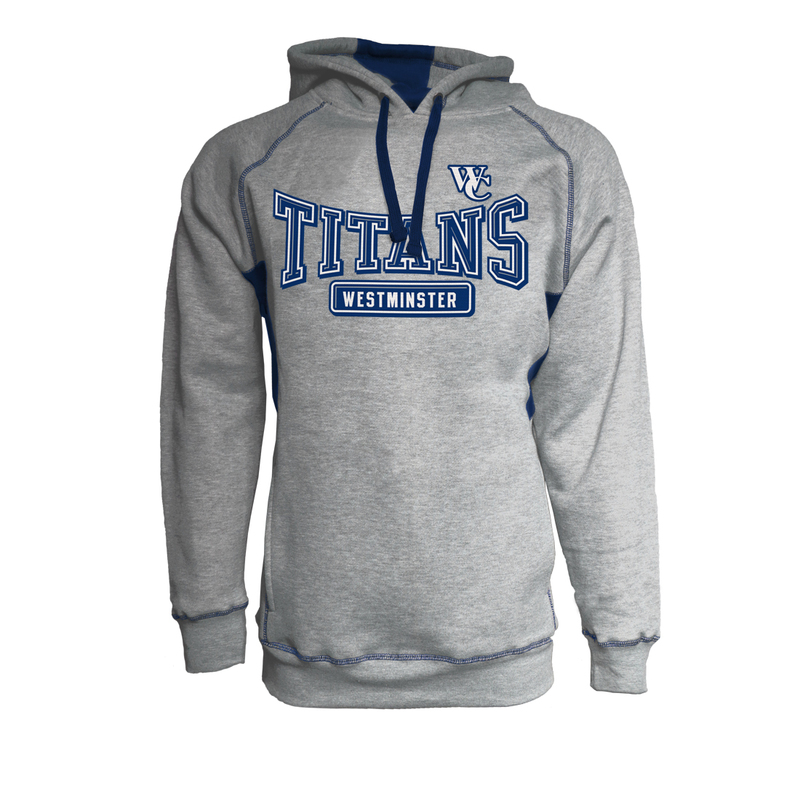 Please select option for Benchmark Hooded Sweatshirt-Graphite Gray. Ouray Benchmark Hooded Sweatshirt features rib knit cuffs and bottom opening with screen print lettering. 65% cotton/35% polyester. 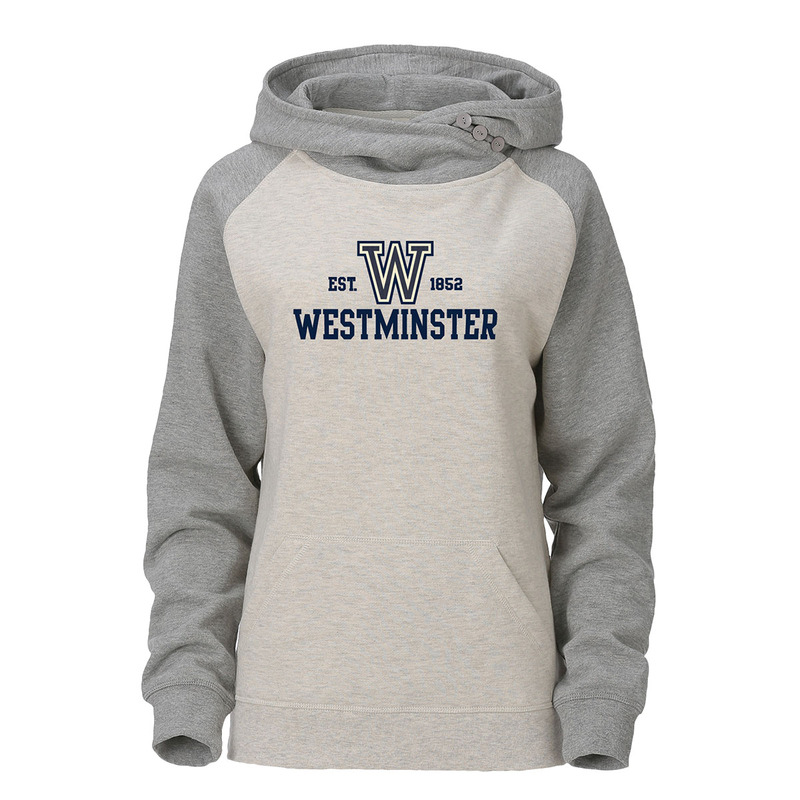 Available in light gray with white/navy screenprint lettering. Please select option for Benchmark Hooded Sweatshirt-Premium Heather Gray. Champion Athletic Fleece hooded sweatshirt has front pouch pocket, gray mesh lined hood with drawcord and back yoke detail. 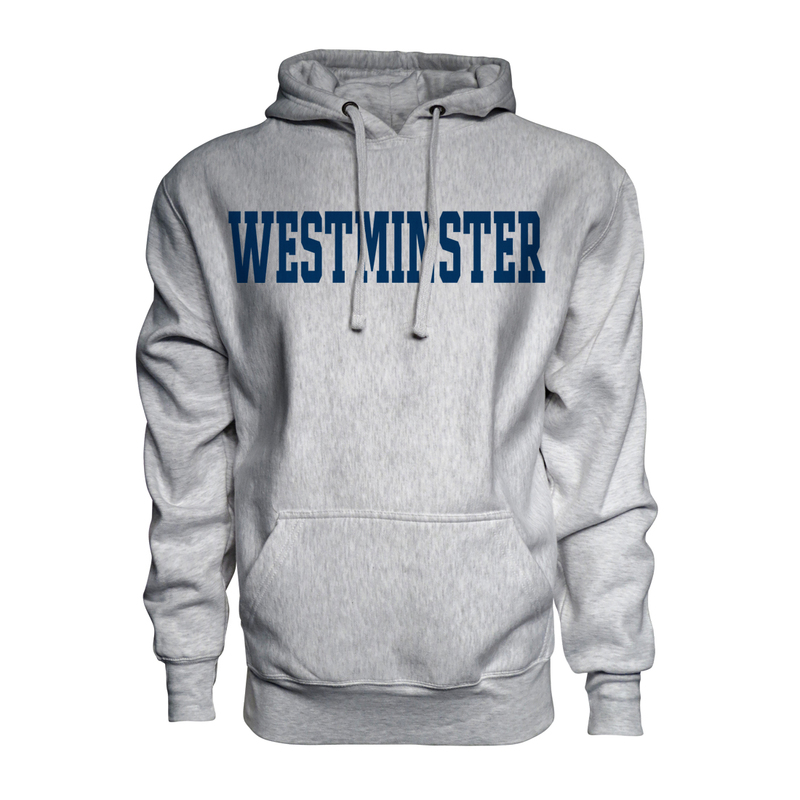 Westminster in metallic chrome ink. 100% polyester. Available in Navy. 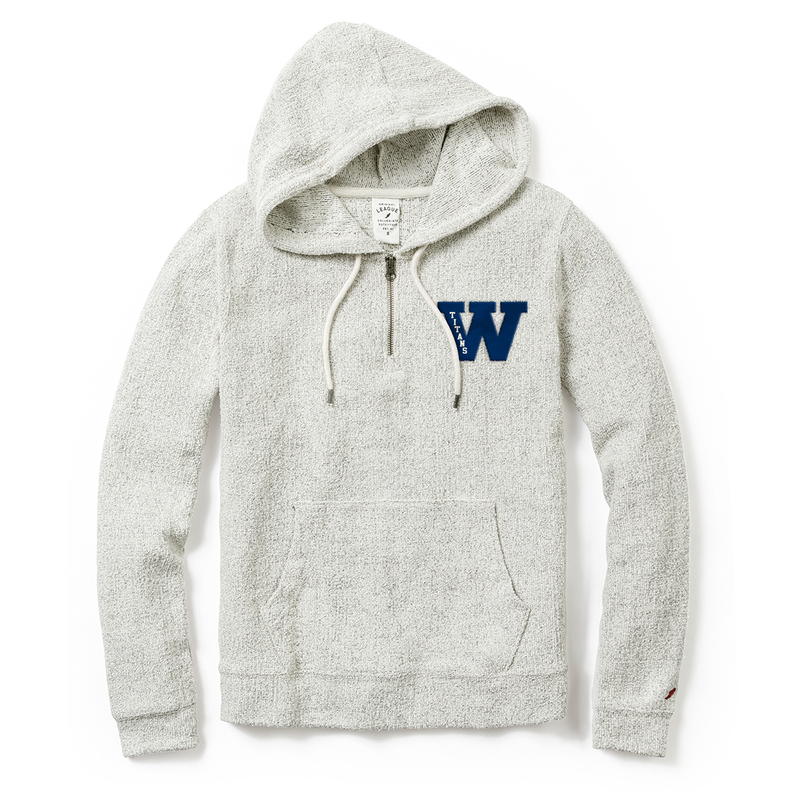 Please select option for Champion Athletic Fleece Hooded Sweatshirt-Navy. Champion Eco Power-blend Hoodie has front pouch pocket and double layer hood with draw cord. Navy and gray screen print lettering. 50 Cotton/50 Polyester. Available in Granite Heather Gray. Please select option for Champion Powerblend Hoodie-Dark Gray. Champion Eco Power-blend Hoodie has front pouch pocket and double layer hood with draw cord. Navy distressed screen print lettering. 50 Cotton/50 Polyester. Available in Light Pink. Please select option for Champion Powerblend Hoodie-Light Pink. Champion Eco Power-blend Hoodie has front pouch pocket and double layer hood with draw cord. White screen print lettering. 50 Cotton/50 Polyester. Available in Navy. Please select option for Champion Powerblend Hoodie-Navy. Champion Eco Power-blend Hoodie has front pouch pocket and double layer hood with draw cord. Navy screen print lettering. 50 Cotton/50 Polyester. Available in White. Please select option for Champion Powerblend Hoodie-White. Champion Reverse Weave Hoodie has heavyweight rib gussets and cross reverse weave fabric for shrinkage control. Sweatshirt has appliqued heavy weight lettering stitched on front. 80 Cotton/20 Polyester Fleece. Available in Navy. Please select option for Champion Reverse Weave Hoodie-Navy. Ouray Vintage Athletic Crew is a heavy weight reverse weave crew neck sweatshirt featuring rib knit cuffs, side panels and bottom opening. 60% cotton/40% polyester. 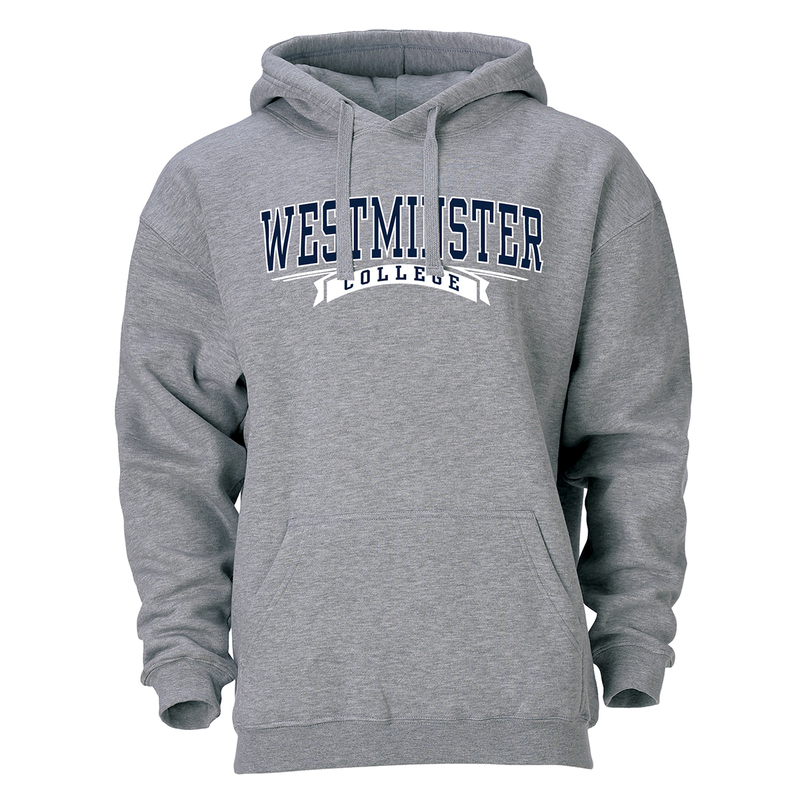 Available in heather gray with embroidered navy and gray tackle twill lettering. Please select option for Classic Vintage Athletic Crew-Heather Gray Reverse Weave. Devon & Jones Men's V-Neck Sweater is lightweight with 2X2 ribbing at neck, sleeves and bottom opening. 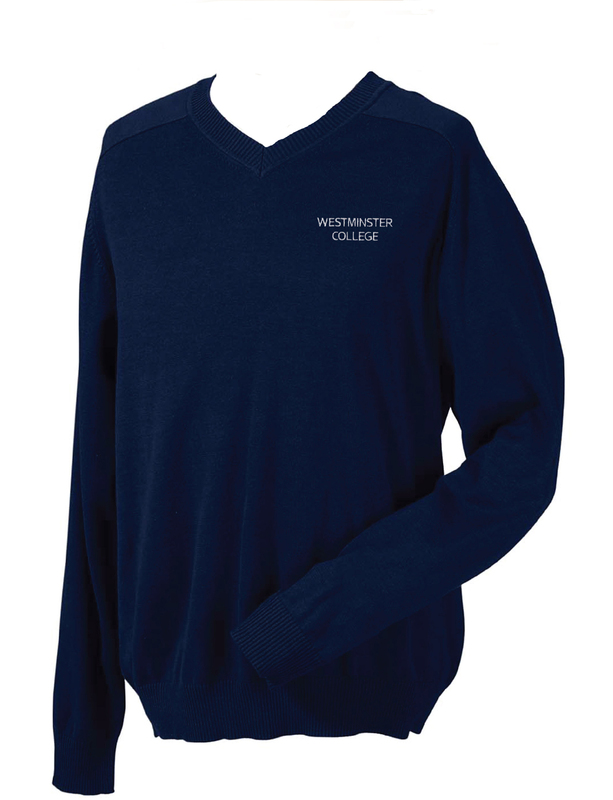 Sweater has Westminster College embroidered in white on left chest. 100% airspun cotton knit. Available in Navy. Please select option for Devon & Jones Men's V-Neck Sweater-Navy. Holloway performance fabric, hooded Football sweatshirt has headset opening and front pouch pocket. 100% polyester. Available in Navy. 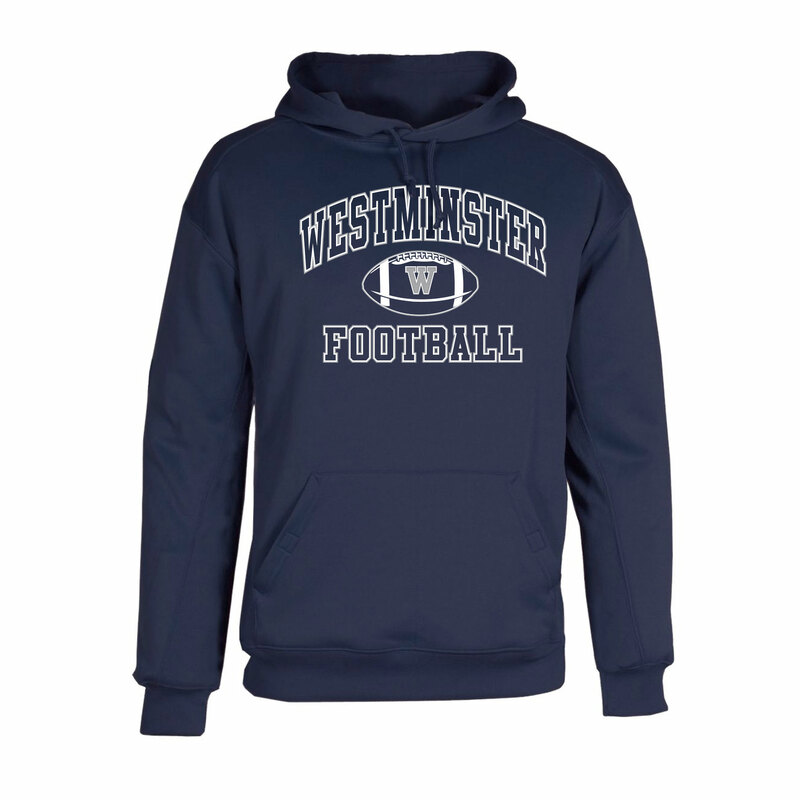 Please select option for Holloway Performance Hooded FOOTBALL Sweatshirt-Navy. 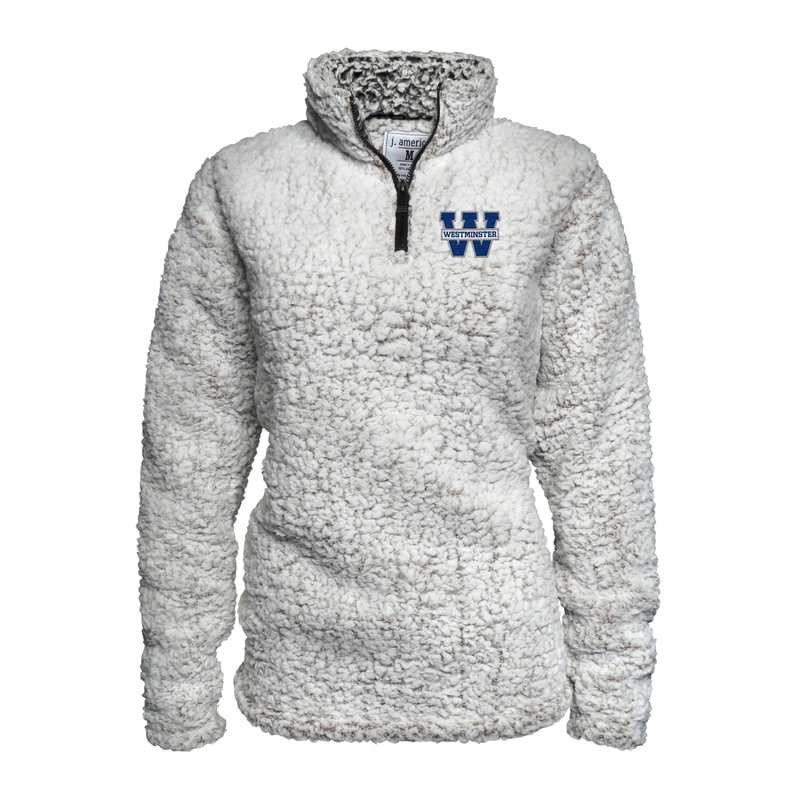 J America Ladies Sherpa Quarter Zip is super soft and comfy featuring a brass zipper and embroidered Westminster over the letter "W". 100% Polyester. Available in Oatmeal. **Runs small--order a size larger. Please select option for J America Ladies Sherpa Quarter Zip-Oatmeal. J America Premium Laced Hoodie has split front placket with hockey style draw-cord laces. 80 Cotton/20 Polyester Fleece. Available in Charcoal Gray. Please select option for J America Premium Laced Hoodie- Charcoal. J America Sport Weave Hoodie has heavyweight rib gussets and cross reverse weave fabric for shrinkage control. 80 Cotton/20 Polyester Fleece. Available in Ash Gray. Please select option for J America Sport Weave Hoodie-Ash Gray. 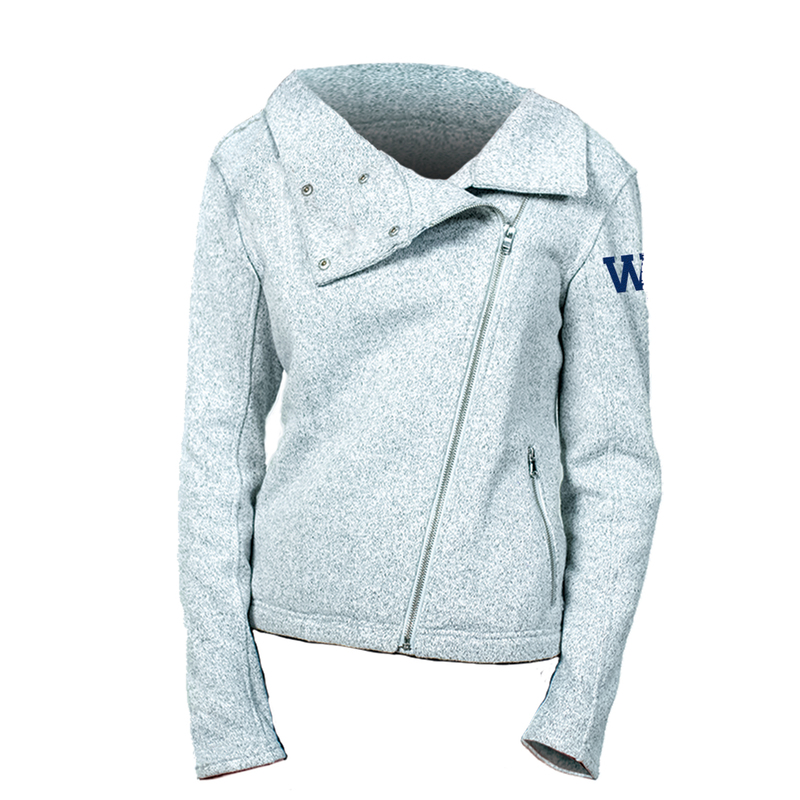 League Ladies Quarter Zip Hood is made from cotton towel terry. Twill applique letter with embroidered Titans inside applique. Garment washed for extra softness. 80%cotton/20%poly. Available in Oatmeal. Please select option for League Ladies Quarter Zip Hood-Oatmeal. 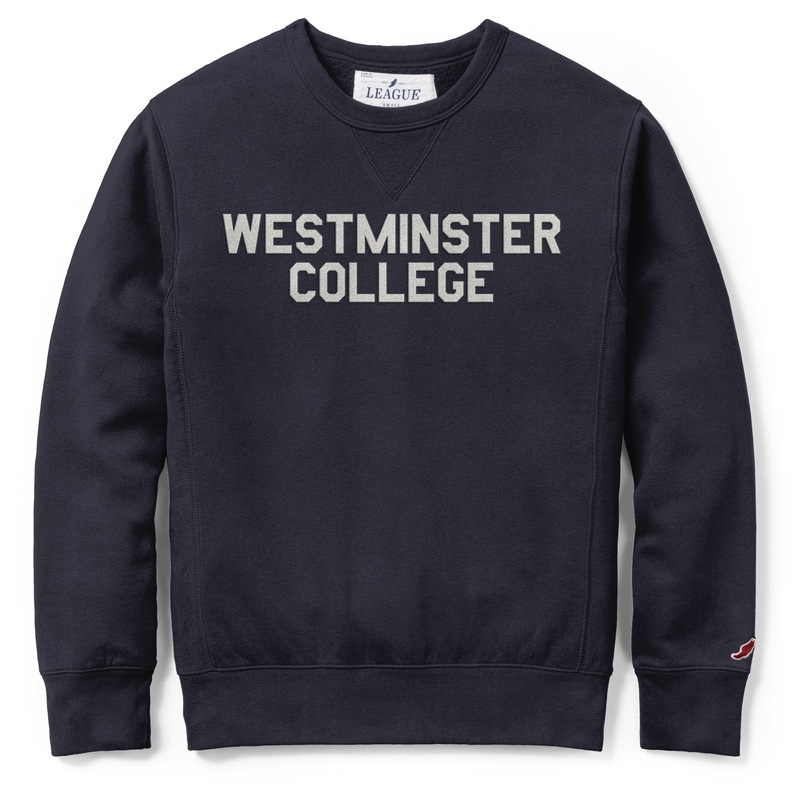 League Stadium Crewneck Sweatshirt featuring Westminster College in felt embroidery, is made from sueded fleece and brushed for extra loft. 80 Cotton/20 Poly. Available in Fall Navy. 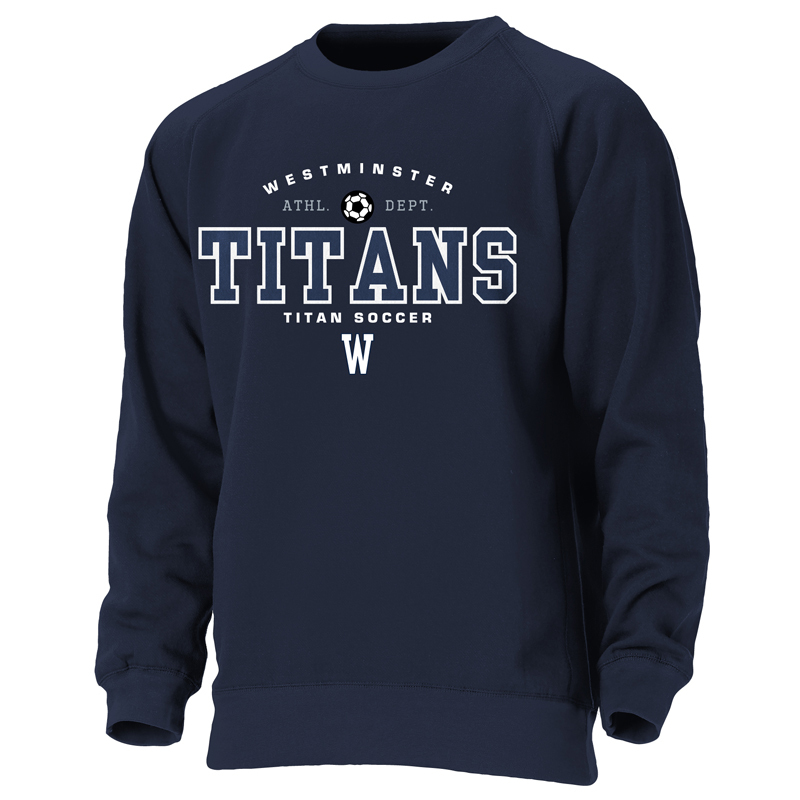 Please select option for League Stadium Crewneck Sweatshirt-Navy. 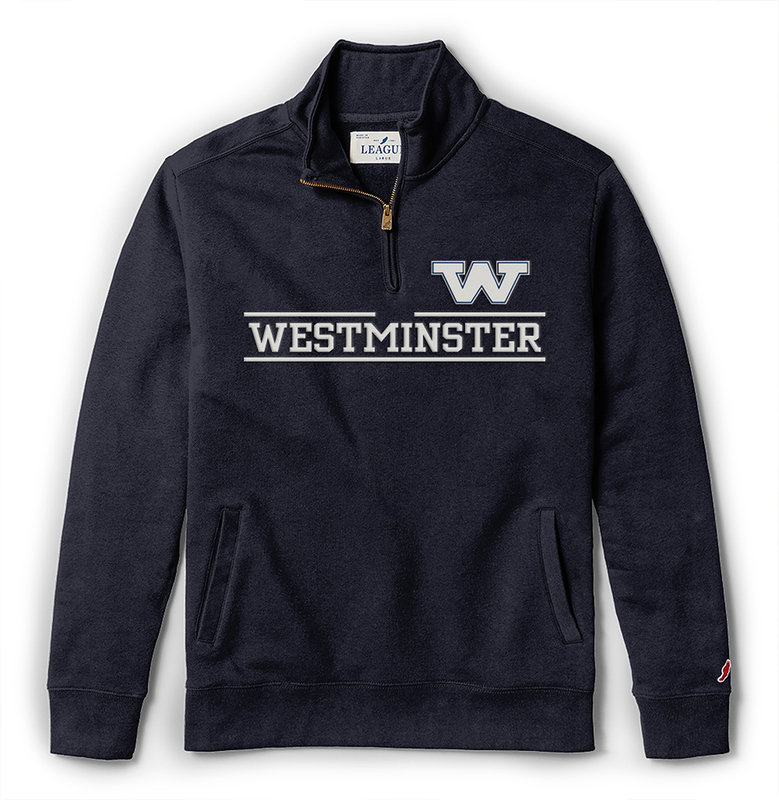 League collegiate quarter zip sweatshirt with tackle twill embroidered lettering and matching ribbed cuffs. Men's sizing. Super soft fabric --80 cotton/20 poly. Available in Fall Navy. 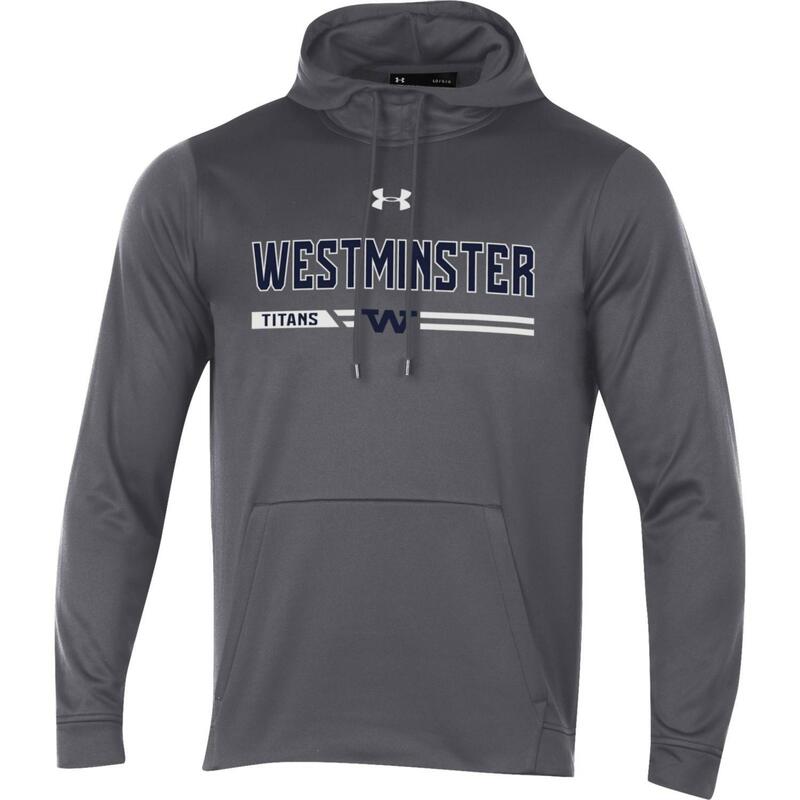 Please select option for League Stadium Quarter Zip-Navy. Ouray Benchmark Quarter Zip features raglan sleeves for ease of movement with rib knit cuffs and bottom opening. 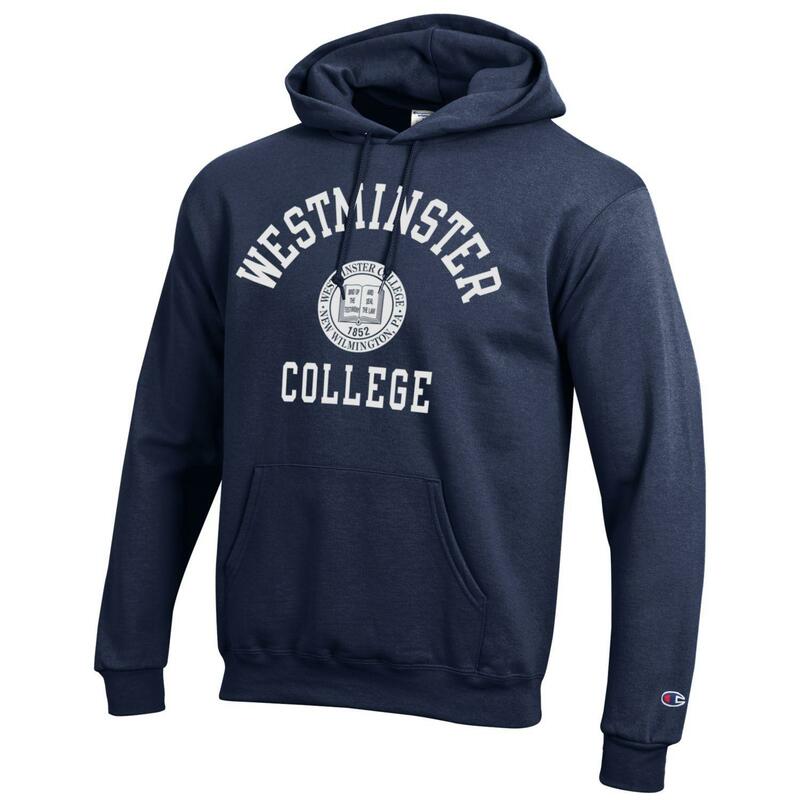 Embroidered Westminster College on left chest. 70 cotton/30 polyester. Available in Navy. 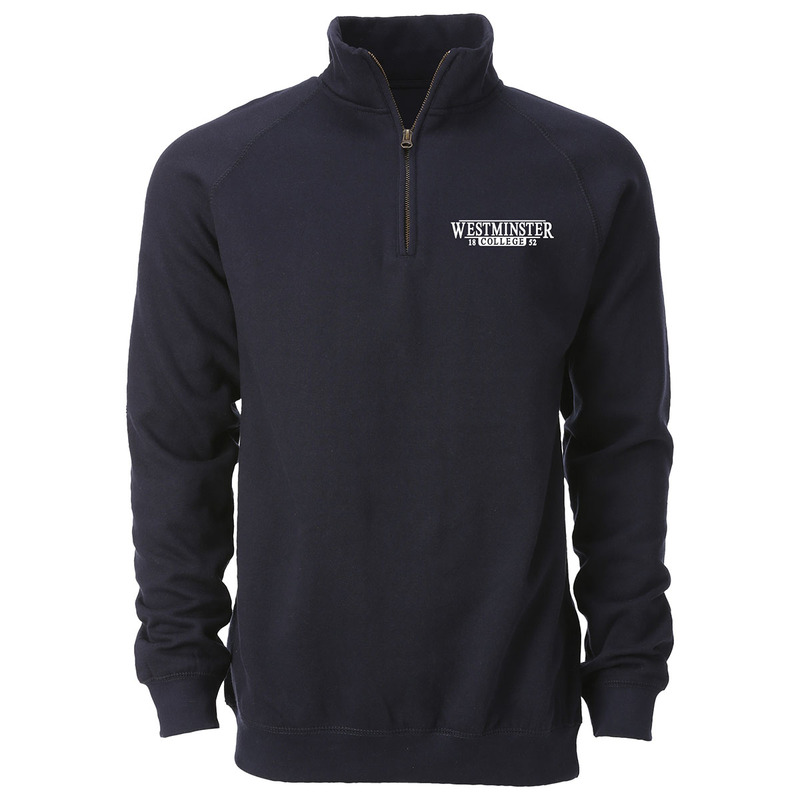 Please select option for Ouray Benchmark Quarter Zip-Navy. Ouray Ladies On-the-Go Hooded Sweatshirt in Heathered Navy is made from a soft, rich, french terry fabric with a relaxed hood and dropped shoulders. Graphic is imprinted in silvery foil lettering for a feminine touch. Perfect for wearing with leggings. Thumb holes in sleeves. 55 Cotton/25 Poly. Available in Navy Heather. 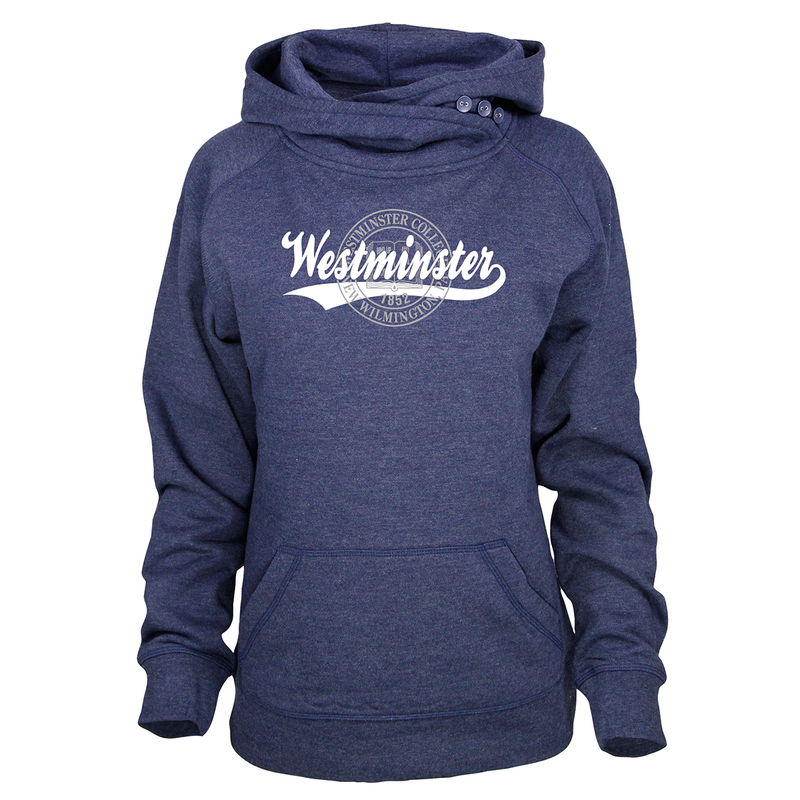 Please select option for Ouray Ladies On-the-Go Hooded Sweatshirt-Heathered Navy. 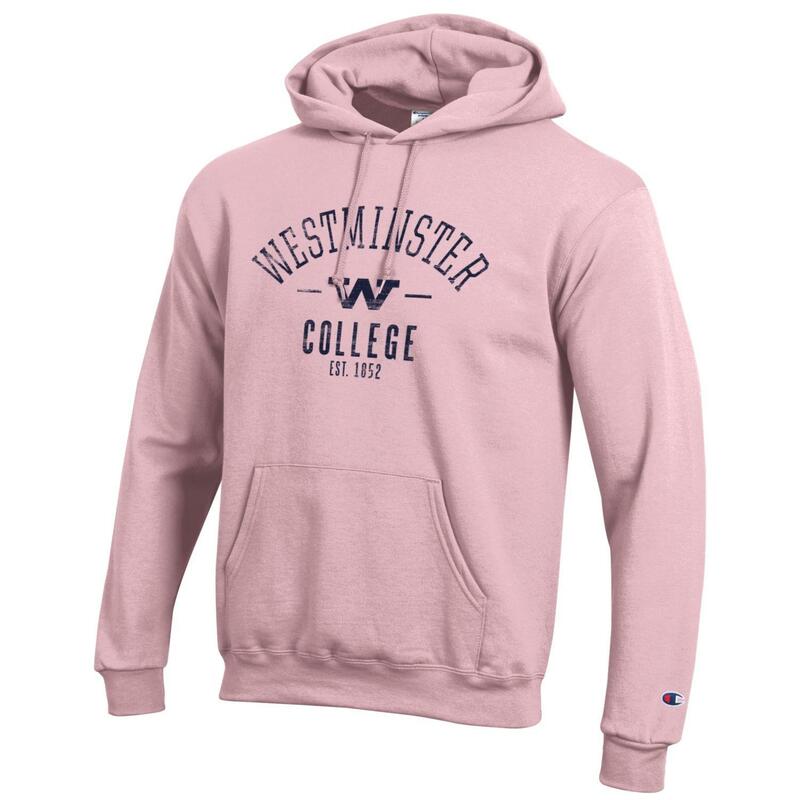 Ouray Ladies On-the-Go Hooded Sweatshirt in Light Pink is made from a soft, rich french terry fabric with a relaxed hood and dropped shoulders. TITANS is written in silvery foil lettering for a feminine touch. Perfect for wearing with leggings. Thumb holes in sleeves. 55 Cotton/25 Poly. Available in Light Pink Heather. Please select option for Ouray Ladies On-the-Go Hooded Sweatshirt-Light Pink. Ouray Ladies Three Button Cowl Hooded Sweatshirt is ultra soft and cozy with screen print lettering. 60/40cotton/polyester. Available in Heather Navy. Please select option for Ouray Ladies Three Button Cowl Hood Sweatshirt-Navy Heather. 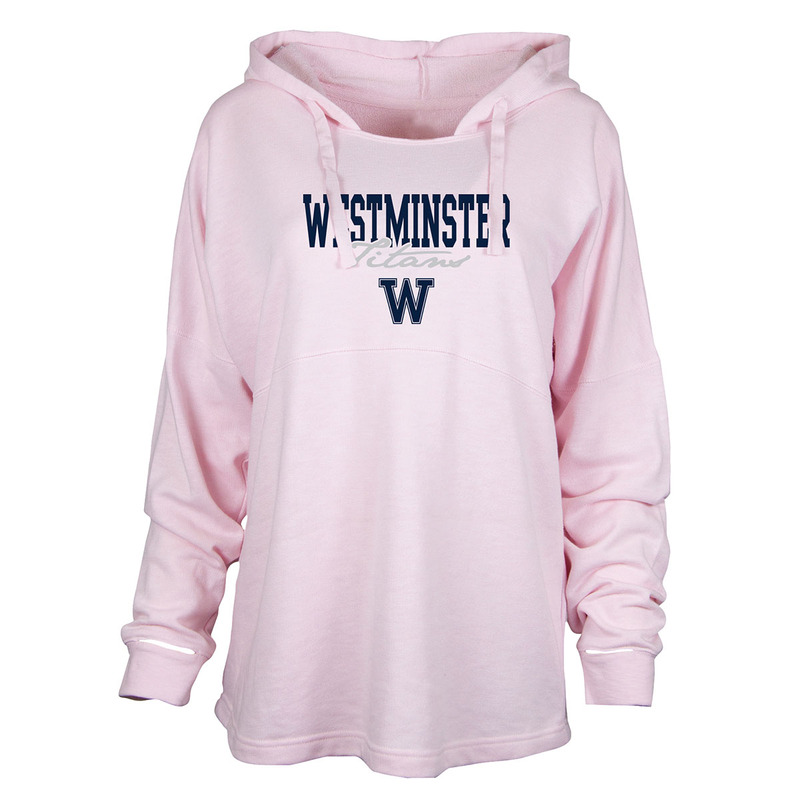 Ouray Ladies Three Button Cowl Hooded Sweatshirt is ultra soft and cozy with matching embroidered lettering. 60/40cotton/polyester. Available in Oatmeal/Heather Gray. Please select option for Ouray Ladies Three Button Cowl Hood Sweatshirt-Oatmeal/Gray. Ouray Benchmark SOCCER crew sweatshirt features embroidered and applique lettering, with rib knit cuffs and bottom opening. 70% cotton/30% polyester. Available in Navy. Please select option for Ouray SOCCER Benchmark Crewneck Sweatshirt-Navy. Ouray Benchmark SOCCER hooded sweatshirt features embroidered and applique lettering, with rib knit cuffs and bottom opening. 70% cotton/30% polyester. Available in Navy. 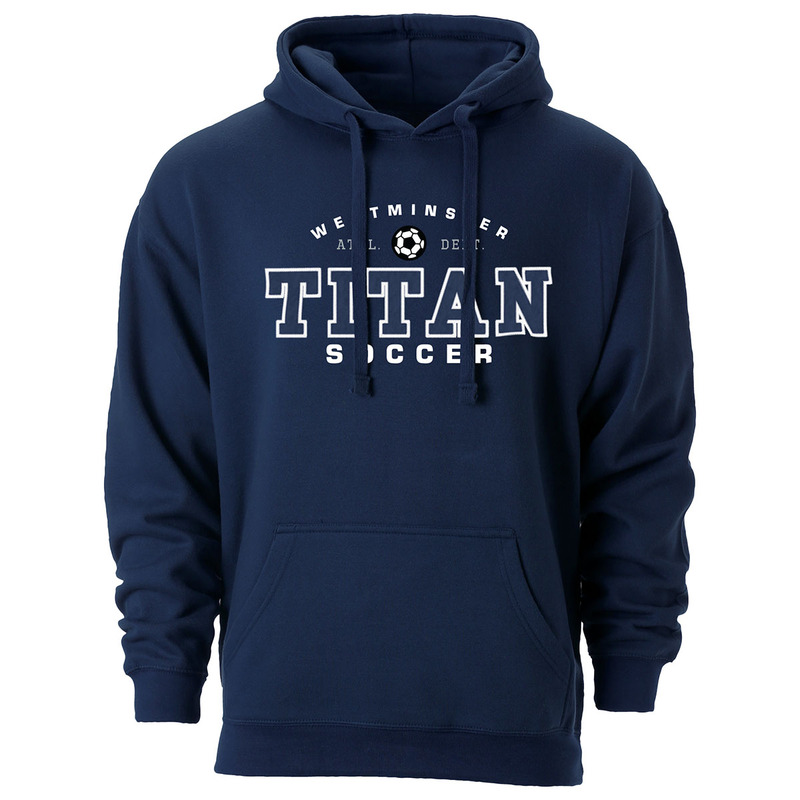 Please select option for Ouray SOCCER Benchmark Hooded Sweatshirt-Navy. Top of the World color block hood has a two-layer hood, featuring a classic kangaroo pouch pocket with navy contrast hood, draw cords and sleeve gussets. Has embroidered and tackle twill lettering. 80% cotton/20% polyester. Available in light oxford gray. Please select option for Top of the World Color Block Hood-Ash/Navy. Top of the World Ladies Knit Moto Jacket is constructed of a richly textured knit in a hearty cotton-blend that softens the rugged moto styling of a semi-fitted jacket with an asymmetrical front zip and zip pockets. Features embroidered navy WC on left shoulder sleeve. 60%cotton/40% polyester. Available in Heathered Ash. Please select option for Top of the World Ladies Knit Moto Jacket-Heathered Ash. Under Armour hooded sweatshirt in Carbon Heather Gray with imprinted Westminster Titans lettering. 100% polyester. Please select option for Under Armour Fleece Hooded Sweatshirt-Carbon Heather Gray. 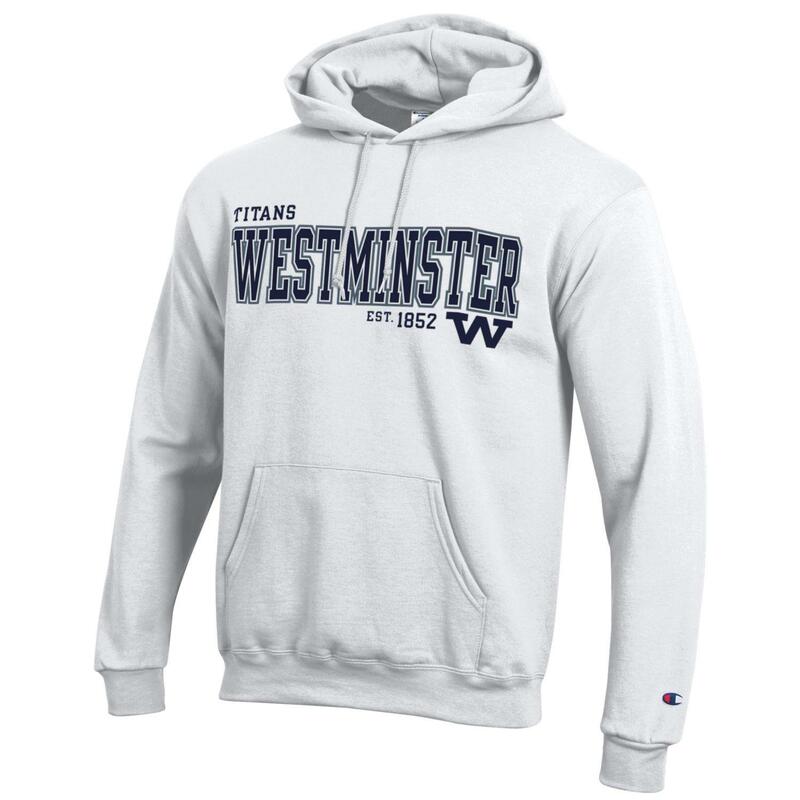 Under Armour hooded sweatshirt in Midnight Navy with imprinted Westminster Titans lettering. 100% polyester. 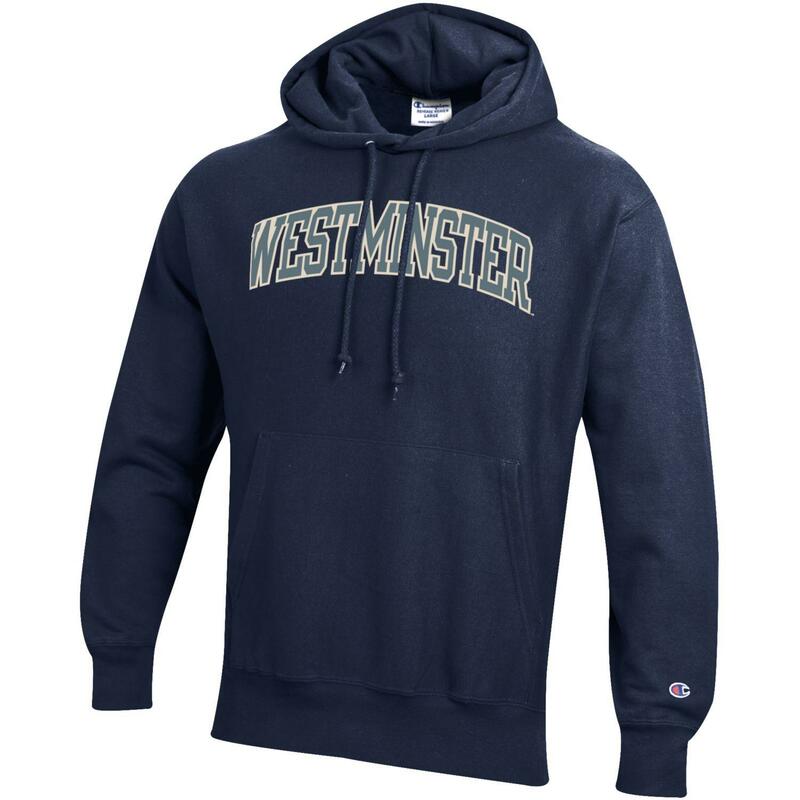 Please select option for Under Armour Fleece Hooded Sweatshirt-Midnight Navy. 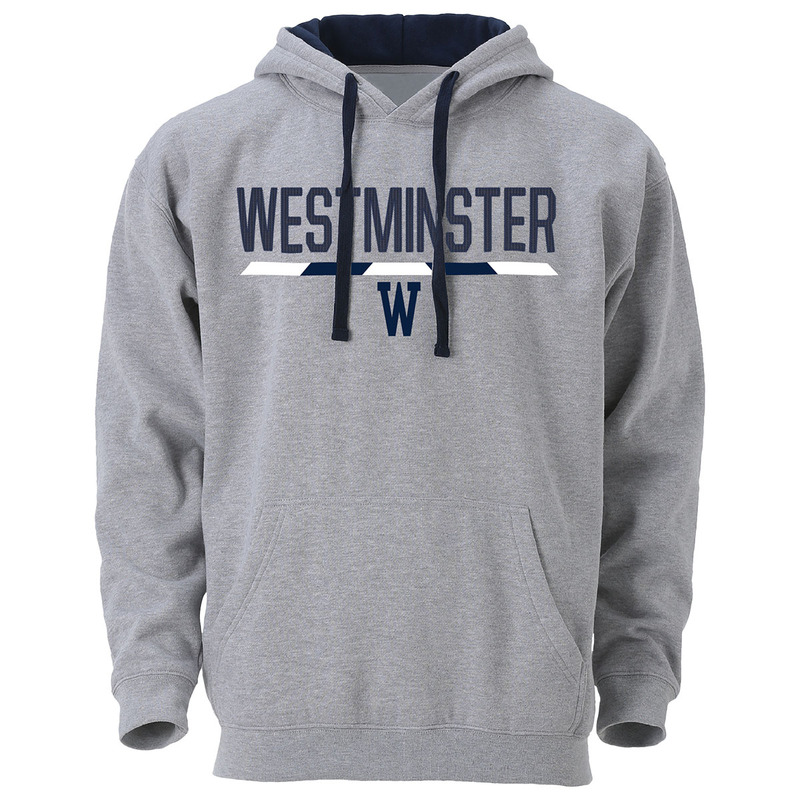 Under Armour hooded sweatshirt in Midnight Navy with imprinted Westminster College lettering. 100% polyester. Please select option for Under Armour Fleece Tech Hooded Sweatshirt-Midnight Navy. 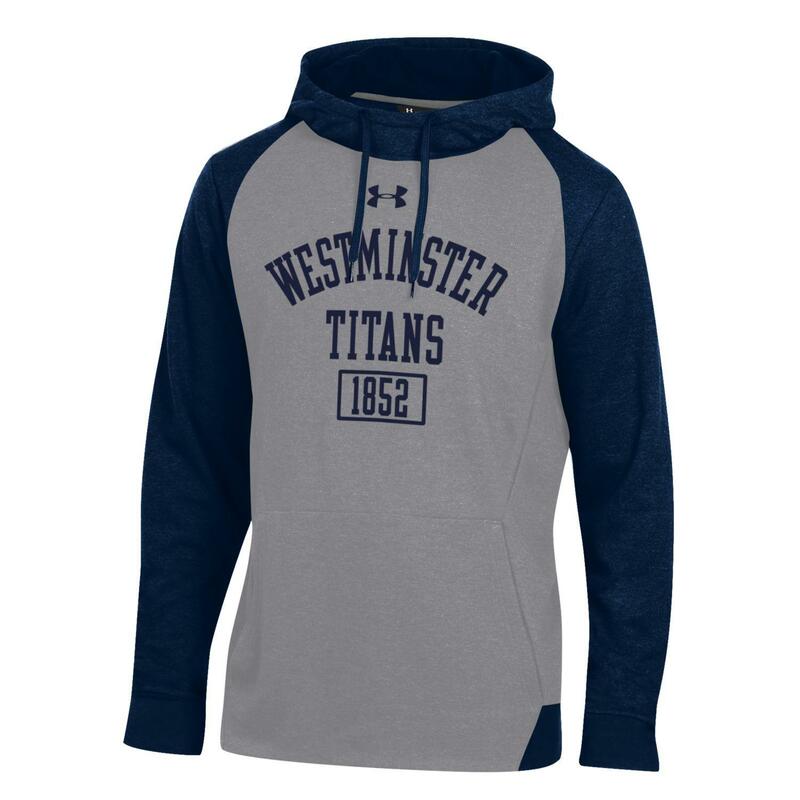 Under Armour Sporty Hood is a very lightweight tri-blend fleece (heavy tee shirt material) with screen printed Westminster Titans 1852 lettering. 56% cotton/35% polyester/9% rayon. 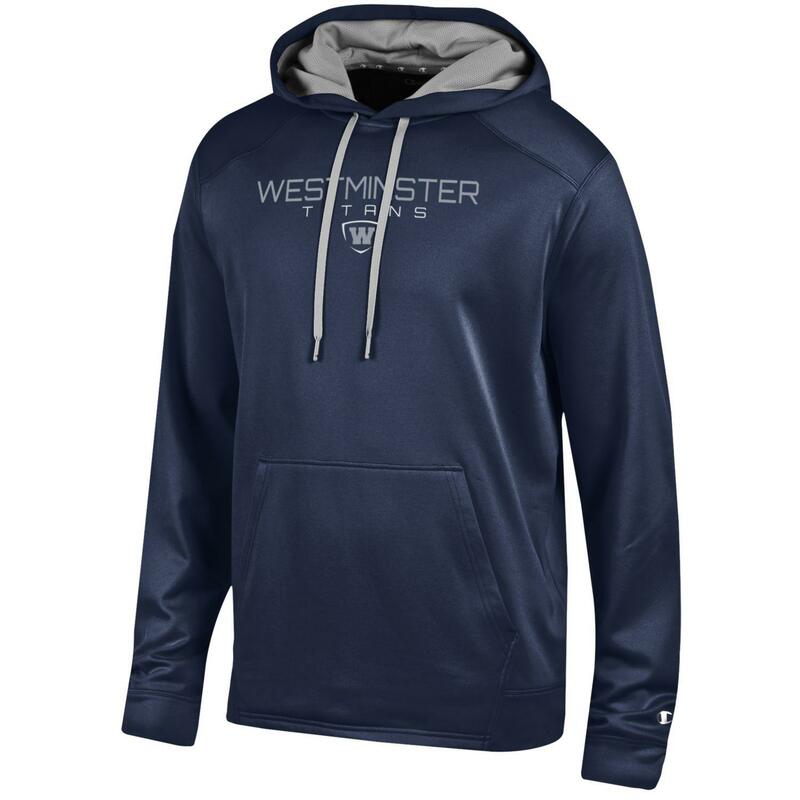 Please select option for Under Armour Sporty Tri Blend Fleece Hood--Navy/Gray. 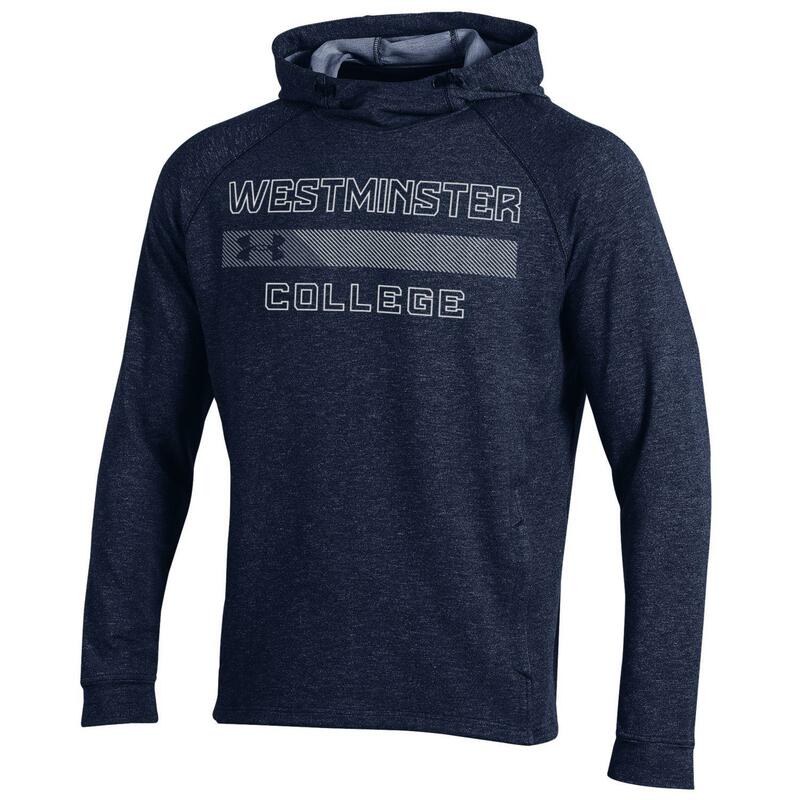 Under Armour Storm hooded sweatshirt in Carbon Heather Gray with imprinted Westminster College lettering. 100% polyester. Please select option for Under Armour Storm Fleece Hooded Sweatshirt-Carbon Gray.